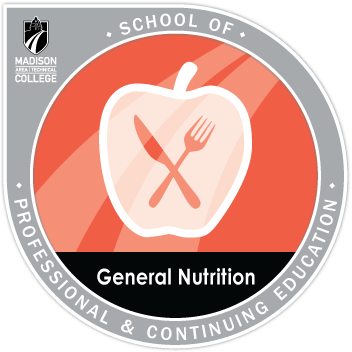 Part of the Dietary Manager Certification, the course covers basic nutrition principles/practices, includes digestion and absorption, sources/functions of nutrients, nutritional needs during the life cycle& nutritional habits. Learn about making wise nutrition choices and the role of nutrition in optimal health. Demonstrated mastery of skills necessary to understand and plan menus utilizing basic nutrition concepts. Research and submit three written solutions to multiple case studies, as well as one modified menu. Conduct research, write, and submit one original essay about eating disorders or obesity in America; and properly demonstrated an understanding of the specialized nutrition needs of various customer groups. Create an educational presentation that requires synthesis and creation in order to teach. Submit an original audiovisual presentation demonstrating competence to teach basic nutrition concepts to a targeted audience.